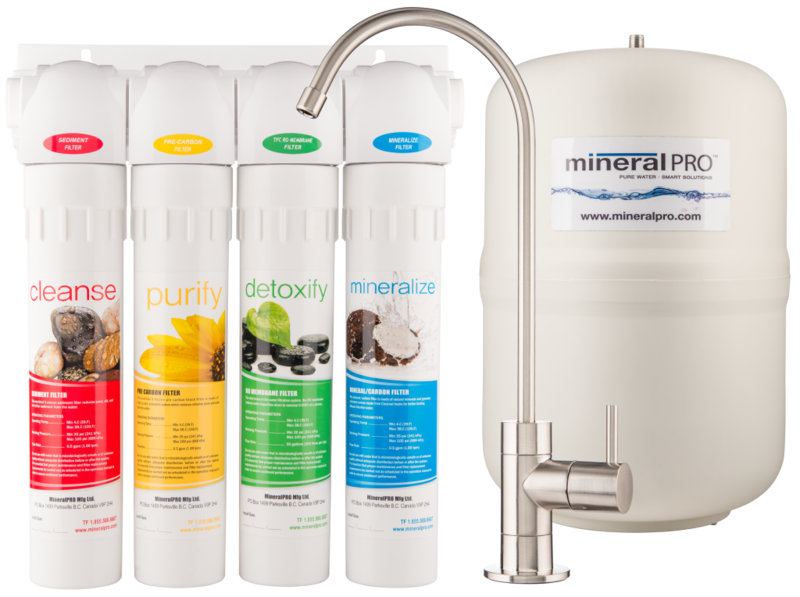 Mineral Pro Mfg is very proud and excited to be introducing our new 700 series Reverse Osmosis with many added features and benefits! Our new 700 Series RO now has an Eco-Friendly RO Membrane- why is this a good thing? This RO Membrane uses 50% less water to flush the contaminants from the membrane than traditional RO membranes. The benefit is a longer Pre-Filter life as less water is flowing through the system in order to clean the RO membrane. These new systems come with most of the fittings and tubes attached – why have we done this? We have tried to make this installation as simple/easy as possible. The tubes come all connected and labels showing where they get connected, so is a “plug and play” install complete with well illustrated simple to follow instructions, no special tools needed, all tubes just “push in” to appropriate fitting. In the past, some people have been intimated by the install and some get confused, but with our new 700 series people are now saying “wow”, what an easy, straightforward install! 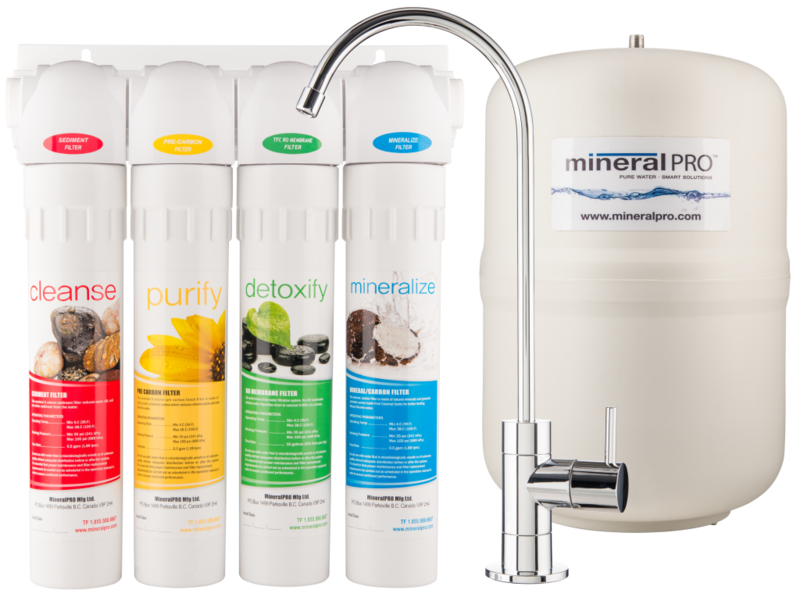 Mineral Pro has added more natural Minerals to our last stage which adds more mineral content to the water, higher PH, more Alkaline and the best part is really great tasting “Mineral Alkaline Water” – why is this important? Most of us in our busy lives do not always eat or drink healthy foods. Many meals are fast food/takeout types which do not always have a source of healthy minerals in them. 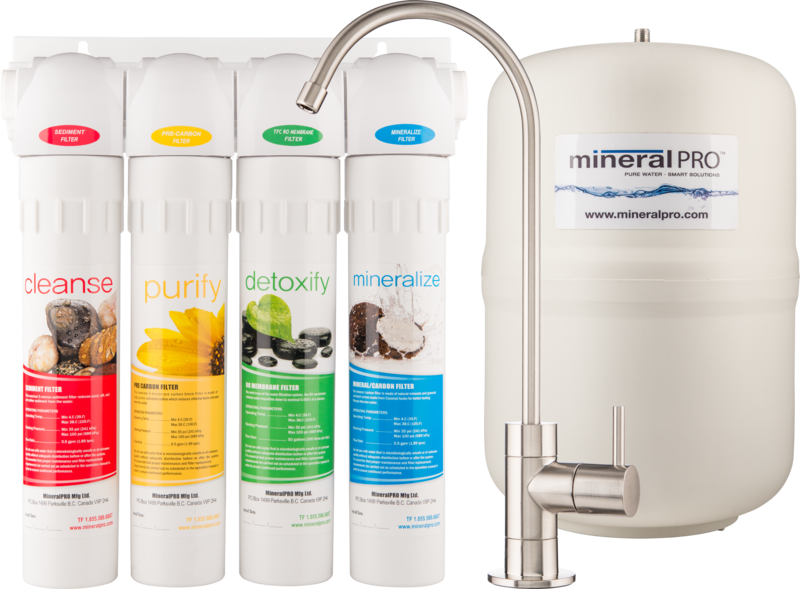 So having great minerals in your drinking water helps in your daily mineral requirement. Plus cooking with our mineral/alkaline water creates delicious tasting foods and beverages, everything tastes better, coffee, tea, soups and all your cooked veggies even your “scotch and water” will taste better. When your drinking water tastes “Great” most people drink a lot more and especially true for kids, less pop, more water. We all need to drink more water for a healthier life! New “Designer” faucets are now included with all of our systems available in chrome and brushed nickel. Customers are really excited about these designer faucets stating they are a great addition to their kitchen decor! These are a high quality, great looking faucet with a sleek and modern simple design! Our new system are a quick change, easy filter replacement. This system has built-in shut-offs in each stage so you do not even need to turn the water off to replace your filters, simple swing cartridge out away from the cabinet and turn a quarter turn to the left to remove, re-insert new filter and turn a quarter turn to the right to lock in. Filters are double o-ringed seal to prevent any leaks and the locking keys on the filter body is very smooth and easy to turn and lock in. Easy to change filters , just flip up and twist. No need to turn off water supply. Takes seconds! 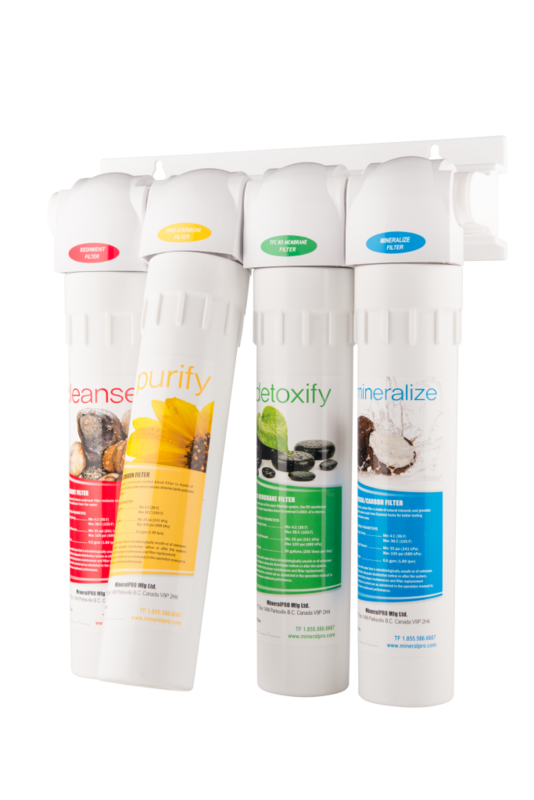 A Better RO filter for less Money! Best part is we have been able to reduce our manufacturing costs so we are very pleased to pass this on to you! We have dropped our RO price by $200, now only $699.95!! We are very confident you will be as excited as we are with your new system! If you do have any issues or install questions you can call or email steve@mineralpro.com , the founder of the company and a qualified 4th generation licensed plumber!